The Man the Downtown Pedestrian Bridge was Named in Honor of in 2002. 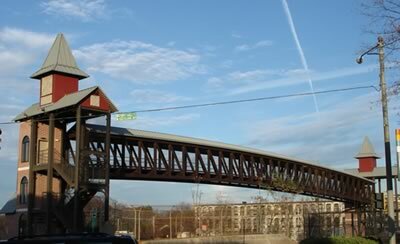 In 2002, the then Mayor, Patsy Joe Hilliard, named the East Point Pedestrian Bridge, next to the East Point Marta station, that extends over the railroad and MARTA tracks ending at East Cleveland Avenue, in Mr. Jackson’s honor. A plaque acknowledging his tireless dedication to our City is located on the East Cleveland Avenue entrance to the Bridge. Mr. James L. Jackson moved to East Point, Georgia with his grandparents, Mr. & Mrs. James and Mattie Meadows in 1926 at the age of three. They resided in a $12.00 per month rental property in the East Washington Avenue and Central Avenue area near the railroad tracks. He remembers the community grocer, school and his neighborhood church only being a few blocks from his home on Georgia Avenue. Mr. Jackson stated the City was a thriving industrial community with seven cotton mills and two chemical plants. For entertainment, the Fairfax Theatre was where black citizens could watch a movie, but upstairs only. In 1942, Mr. Jackson enlisted in the United States Civil Service where he traveled worldwide gaining knowledge and many useful skills. He retired from the Army as a Tech Sergeant, and returned to East Point in 1946, and obtained employment as a mechanic’s assistant and driver for the federal government. 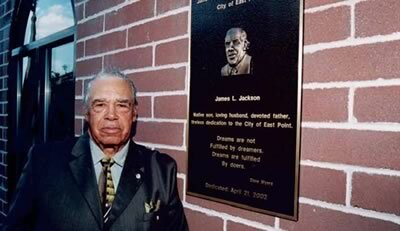 In 1972, Mr. Jackson was the first black man to run for election for the East Point Councilman position in Ward B. He ran for this position from 1972-1988 consecutively, and although he did not win, he became very popular and accomplished many positive endeavors in the East Point community. Mr. Jackson stated, "It is not about winning or losing, but achieving". He has been on several boards and committees during his life in the City of East Point including president of the Gus Thornhill Scholarship Committee, member of the bi-racial council, and a member of the East Point Housing Review Board. Mr. Jackson is nearly 90 years old, and continues his 80 plus years of church service at East Point First Mallalieu United Methodist Church, a 2002 successful merger of two historic churches in East Point: Mallalieu United Methodist Church (Mr. Jackson’s church as a boy), and East Point First United Methodist Church. During Mr. Jackson's long life there have been many blessings, and, of course, there have been some hard times woven in as well, but with a few tears and a smile, he expressed that he gives the praise and credit to God for enabling him to endure and grow from them, provide for his family and serve others in East Point and abroad. I asked Mr. Jackson if he had any last words to share and he stated, "Pray that I may be of service to someone". My last question to Mr. Jackson was if he ever plans to move away from East Point. He exclaimed, "No way! East Point is the best city in the world"!